We have the Extra Mini and the Square Mini for the Classic Flap Bag. Why can’t we have the Mini for the Boy Bag? Well, if you’re asking the same question, then we have a surprise for you. For the Spring Summer 2018 Collection, our dream has finally come true. 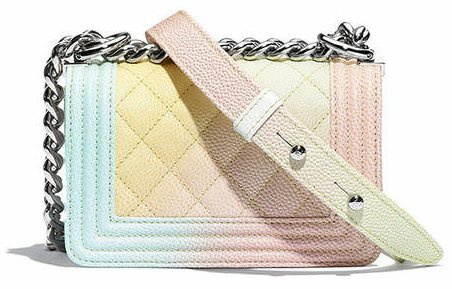 The French Fashion house has created the Mini Boy Chanel Bag and it’s the smallest size in the classic Boy Bag Collection. And now? We have plenty of questions unanswered. For example; how mini is this handbag compared to the Small Boy Bag? And how is it different than the Extra Mini? Or is it comparable to the Boy WOC? The Mini Boy Bag looks exactly the same like the bigger sizes, but of course it has been downsized. 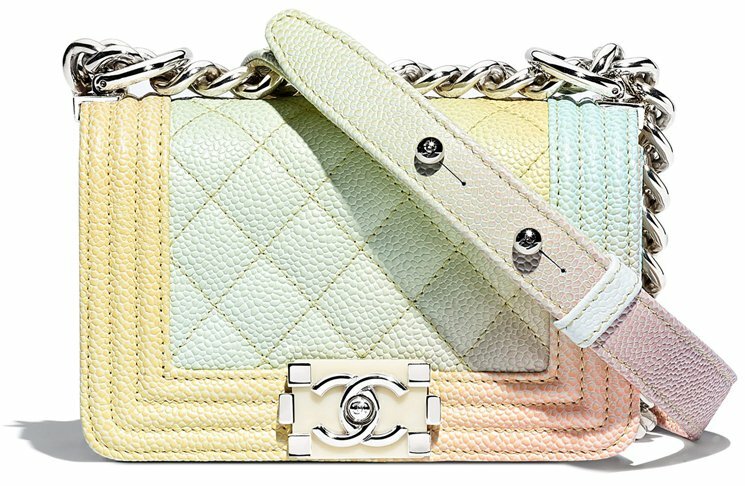 For this new season, Chanel has created the Mini Boy in Rainbow style; just like colors in the fairy-tale unicorns. If you like the classic shades, then perhaps there are more choices available. Please check with the SA. We’re also certain that more colors will be introduced in the future. 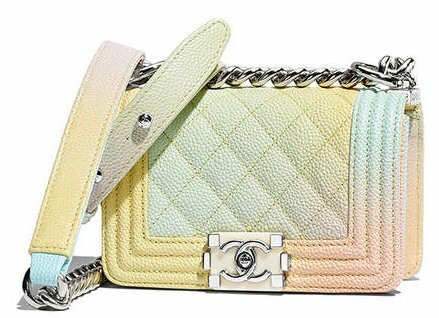 This bag is made with a quilted body for the elegant look. It has a bit if boyish appeal due to the iconic studded Boy Clasp as well as the oversized but shiny chains. You can carry this bag on the shoulder or cross body. The Mini size is just incredible cute. The Small Boy Bag was already very tiny because you can grab it with just one hand. It was the cutest and the smallest bag available for this line. But now everything has changed because the Mini Boy Bag has born. It’s much tinier than the small bag and so much cuter. However, the Mini size might be too tiny for you, then the small size is the best option. But let’s compare them together. The Small Boy Bag is measured 4.7’ x 7.9’ x 2.8’ inches while the Mini Boy Bag is measured 3.7’ x 5.9’ x 2.8’ inches. So what is the conclusion? The Mini Boy is smaller in terms of length and width, but the depth is as big as the small size. And even tough it’s tiny; certainly we can think of some circumstances when we can use the bag. Perhaps you need to change your mind about the Boy WOC and just grab the Mini instead! Previously, if you wanted the smallest size of the Boy Bag, you have just one option. Consider the Boy WOC. But the Boy WOC was like a wallet with a chain, it was somewhat different than the small, medium or large handbag. The feel, the looks like the Boy Clasp (which was much smaller) or the chain were all different. Now that we have the Mini Boy Bag, let’s compare it with the Boy WOC in sizes. The Chanel Boy WOC is measured 4.8’ x 7.6’ x 1.4’ inches and the Mini Boy Bag is measured 3.7’ x 5.9’ x 2.8’ inches. Well, are you now surprised? The Boy WOC is bigger in terms of width and length; in fact it’s much bigger and in one way (length) even a bit bigger than the Small Bag. However the Mini Boy Bag wins when it comes to the measurement of depth, meaning it can store a bit more stuff while remaining small. The Boy WOC however, is flatter and can store only the basic essentials. The most difficult decision you’re going to face is going to choose between the Mini Boy Bag or the Extra Mini Classic Flap Bag, because both of them are popular, iconic, classic and water-mouthing obsessive. We cannot decide for you, but we can do a quick comparison to see which one is bigger and smaller. The Extra Mini Classic Flap Bag is sized 4’ x 7’ x 2’ inches while the Mini Boy Bag is measured 3.7’ x 5.9’ x 2.8’ inches. So what do you think? The Extra Mini Classic Flap Bag is evenly sized in terms of length, but smaller in terms of height. Generally, the Mini Boy is a big bigger than the Extra Mini. But how about the Square Mini? Let’s do a quick comparison for this bag as well. The Square Mini Classic Flap Bag is also a very famous handbag and it’s bigger than the Extra Mini. The Square Mini is measured 5.3’ x 6.7’ x 3.1’ inches while the Mini Boy Bag is measured 3.7’ x 5.9’ x 2.8’ inches. So if you’re looking for a bigger size of the Mini, the Square Mini might be the best pick. However, the look is completely different than the Mini Boy. So it’s up to you to decide, difficult huh? The bag is made in grained calfskin. The style code is A67364, measuring 3.7’ x 5.9’ x 2.8’ inches, the price for the rainbow style is $3100 USD, $4025 CAD, €2890 euro, £2620 GBP, $4860 SGD, $4550 AUD, ¥399600 JPY, 15150 MYR via Chanel boutiques.